You don't even need to know that URL. 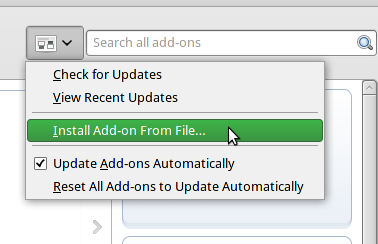 You would simply go to the Add-ons page in Thunderbird, using Tools|Add-ons and enter the add-on's name into the search box. Click on Install, wait for it to be downloaded, then click on Restart Thunderbird when prompted. You may have been given an URL for the add-on, or the add-on you want isn't on the "official" page. Searching for it, as shown above, doesn't deliver the goods. Visit the webpage in your browser. There you will see a link to download the add-on. If you are a died-in-the-wool Mozilla enthusiast and you're using Firefox or Seamonkey, don't left-click this link. Your browser will see that it is an xpi file and will assume it is intended to be installed in your browser. If you're using another browser, then a left-click might lead your browser to attempt to download and "open" the xpi file, which won't be useful either. You have two routes open to you. Right-click the link and select Save As or Save Link As. You will be invited to download and save the file. Don't ask me where it is; that's something between you and your browser. Most browsers have a default download location, often your Desktop. Make a note of where it downloads to, and what it's called. Some add-on files have silly names like “latest-234.xpi” which is ponderously unhelpful when you're trying to find it later on. Navigate to your downloaded xpi file, select it, and off you go. If you are using Windows, you can even skip the desktop bit. 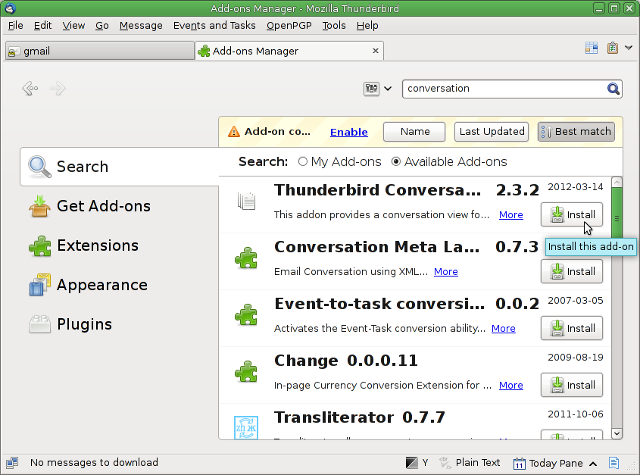 Open your browser and Thunderbird side by side, with Thunderbird's Add-ons page on show. Drag the link directly from the browser onto Thunderbird's Add-on window. The main disadvantage of this method, as far as I can see, is that you don't get your own copy of the xpi file in case of wanting to re-install it later on. If you are a Linux user and obtained Thunderbird from your distro's official repository, then look there first for Lightning or Enigmail. Ubuntu users: If you have added a PPA to your repositories list, then again, look there for Lightning or Enigmail. In either case, all updates and un-installation should be carried out via your system's software manager. If you have uninstalled the official version and are using the tarball downloaded from the Mozilla site, then you should seek out the relevant builds of Lightning and Enigmail on their respective websites, if Thunderbird's add-ons search cannot locate them for you.